I think the British Library has an entire illuminated manuscript online (unfortunately I don't remember the title), and if I remember correctly there's a lot of supplementary information to go along with it. Might be worth looking for. Aha, here it is: http://www.bl.uk/catalogues/illuminatedmanuscripts/welcome.htm They actually have more than one available digitally. Buddy, have you heard of the cartoon "The Secret of Kells?" It is a movie based off the "creation" of Folio 34. The story is okay, the ending left me a little wanting, however the animation makes it worth watching at least once. Oh, coolies! Thanks for sharing, heidenkind. Wow, that site looks like a fantastic resource. If I ever teach a class on illuminated manuscripts, this would be a great site! phin, I haven't even heard of that movie! I was going to suggest that we should watch it together the next time I am visiting you, but you've already watched it "at least once." There is also a UCLA site that a catalogues all online medieval manuscriprt collections! A 2009 volume I am really enjoying on the topic is "Materials, Methods and Masterpieces of Medieval Art" by Janetta Benton. Great! Thanks for those recommendations, H! They look like good resources. I'll keep my eye out for the 2009 publication by Benton, too. An emeritus professor of religion contacted me yesterday, recommending this site after stumbling across this post. 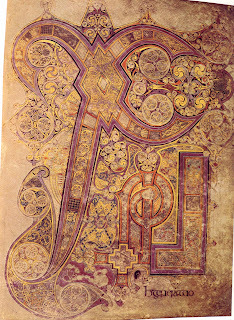 This website not only includes some images of other folios from "The Book of Kells," but also has a great quote from Gerald of Canturbury (a 12th century monk). 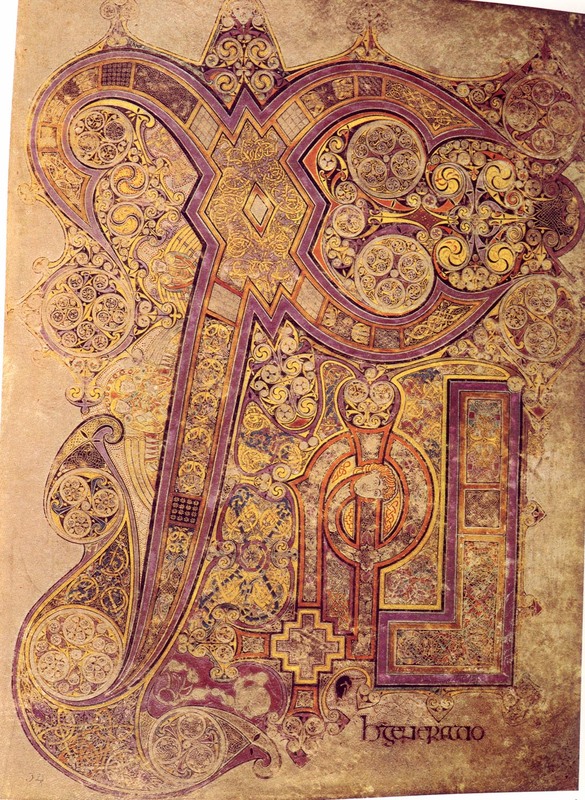 "This book contains the harmony of the four Evangelists according to St. Jerome, where for almost every page there are different designs, distinguished by varied colors. Here you may see the face of majesty, divinely drawn, here the mystic symbols of the Evangelists, each with wings, now six, now four, now two; here the Eagle, there the Calf, here the Man, and there the Lion, and other forms almost infinite. Look at them superficially with the ordinary casual glance, and you would think it an erasure, and not tracery. Fine craftsmanship is all about you, but you might not notice it. Look more keenly at it, and you will penetrate to the very shrine of art. You will make out intricacies, so delicate and subtle, so exact and compact, so full of knots and links, with colors so fresh and vivid, that you might say that all this was the work of an angel, and not of a man. For my part the oftener I see the book, and the more carefully I study it, the more I am lost in ever fresh amazement, and I see more and more wonders in the book."